This fast-paced suspense novel features ex-con turned PI Gus Corral on a case involving a famous baseball player and a trip to his native island. Ex-con Gus Corral is at peace with his new life as a private investigator. He’s good at his job, even if he’s mostly a delivery man or a “go-for” guy trying to expose—or protect—someone else’s secrets. An unexpected visit by Joaquín “Kino” Machaco, the Colorado Rockies’ all-star center fielder who defected from Cuba as a teen, disrupts his routine. The famous ballplayer needs help: His brother has a gambling problem and owes a lot of money to a Cuban criminal who’s threatening their family. He needs Gus to travel to the island with his brother to hand over half a million dollars in cash. Not only will Gus need to keep the money safe from the inveterate gambler, he’ll have to convince the “entrepreneur” to leave Machaco’s family alone after the payoff. Gus’ visions of relaxing on warm, beautiful beaches accompanied by Latin jazz and rum concoctions are immediately dashed. A hail of bullets—violence virtually unheard of in the autocratic nation—leaves one dead and several wounded and leads to unforeseen ramifications that will come to a shocking, bloody conclusion in Denver. 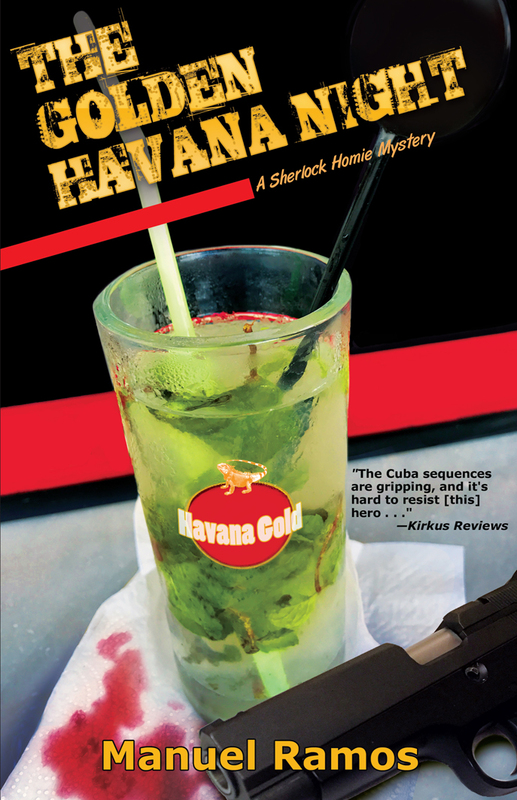 Narrated by Gus Corral in his sardonic voice, The Golden Havana Night reveals a complicated, secretive island where nothing is really secret. MANUEL RAMOS is the recipient of several literary awards and the author of numerous books, including My Bad: A Mile High Noir (Arte Público Press, 2016), Desperado: A Mile High Noir (Arte Público Press, 2013), The Skull of Pancho Villa and Other Stories (Arte Público Press, 2015), Brown-on-Brown: A Luis Móntez Mystery (University of New Mexico Press, 2003) and The Ballad of Rocky Ruiz (St. Martin’s Press, 1993; Northwestern University Press, 2004), an Edgar Award finalist. He lives and works in Denver, Colorado.